The Philippines never had a more beautiful First Lady before or since Imelda Romualdez Marcos. Statuesque at 5'7", she has a figure as stunning as her angelic face. During the Martial Law years of her husband Ferdinand E.Marcos (1972-86), she was the most powerful woman in the country. She earned the title "STEEL BUTTERFLY". 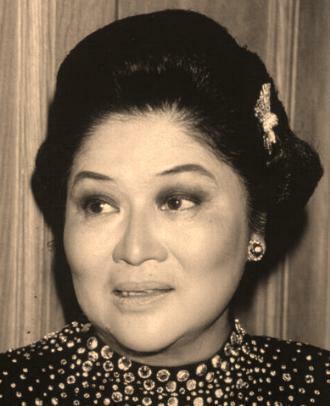 There was nothing that she could not do and no one can ever defy her, not even her husband (whom he caught cheating with the American B-movie actress Dovie Beams ,here to do another movie about the Marcoses in the early 70s.From then on, she used this as an emotional and political blackmail against her husband). showed them who the Boss Lady was! She flaunted her extravagance as if to tell her half sisters that she's got it made now, and she's higher and better than them...(hence, the phsychology of the 3,000 pairs of shoes perhaps?). As First Lady, Imelda wielded tremendous power.She was not a wall flower .She jet setted around the world talking to world leaders in behalf of her husband on political matters. She became Minister of Human Settlements (1978-86) and Governor of Metro Manila (1978-86). Inspite all the unfavorable reviews we have of Imelda, one thing positive in her favor is that she got things done quickly and well.If she plans to build a heart center, it was done.If she wants a cultural center, lo and behold, it was built! Thats how she earned the nickname "Steel Butterfly", soft and feminine on the outside but hard and tough on the inside! In her own way, she put the Philippines on the map. People took notice of this country because of her...her beauty, her charm, her caprice, her extravangance,her elegance, her political shrewdenss, her jewelry, her 3000 pairs of shoes, etc.. But most of all, she was known to drive a hard bargain. Whatever Imelda wants, Imelda gets! I don't know if I should praise her or despise her..but she was one tough lady and an even tougher act to follow.